When people are searching for ways to replace lost or stolen car keys sometimes the price can be an important factor. But in security, a low cost has a higher chance of danger. When you turn to the internet for aftermarket electronic car keys, you can place yourself at a greater risk of getting a product you cannot use. Whether you are looking to replace a car key or remote, you should know about the hazards of aftermarket electronic car keys. There are several types of aftermarket electronic car keys that we will be talking about. They share similar dangers, but it is important to know that not all aftermarket electronic car keys serve the same purpose. You need to be on the look out for just what type of key you are looking to buy. A transponder key is a physical key that has a chip inside of it. The chip is often placed underneath the plastic cover on the bow (the part that you hold onto in order to turn the key) of the key. If the bow of your key has a remote installed on it, the transponder chip may also be in this plastic. These keys still need to be inserted into the ignition cylinder of a car. They are not the same as keyless entry devices. Once you buy any aftermarket electronic car keys that have these chips, you will have to undergo some form of transponder key programming. If you are getting a new transponder key, be sure that the blade is blank. There should not be any grooves on the key you have purchased. This is because this device requires car key cutting as well as programming. Most hardware stores that sell locks will be able to make the shape the grooves on a key cutter, but programming may be a little tricky without a spare on hand. If you do not have a working transponder key for your car, it will need to be programmed using your car’s onboard computer. Be sure you consider all the replacement needs before looking into aftermarket electronic car keys. 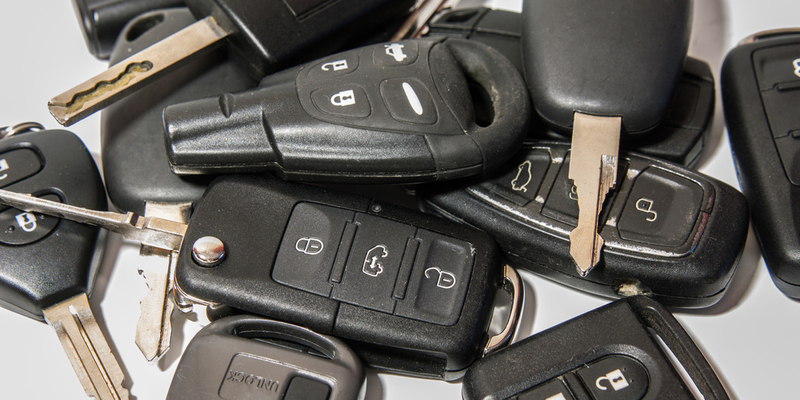 Whether or not you need a key fob replacement is easier to determine than transponder keys. If your car has a push button start, then you use a key fob. These types of aftermarket electronic car keys are complex mechanisms and are require devices with certain specifications. You need to make sure that you buy a product that works with the make and model of your car. Unbranded aftermarket electronic car keys may work, but they should be reviewed with a higher level of scrutiny. A car key remote can be part of a key fob or a transponder key or separate, however, it is just meant to be used a distance. These are the devices that you click to unlock, lock, or set off the panic alarm. If you are just looking for a new remote, and not a device that will actually start the car (not including the new remotes that can remote start your vehicle… because those are also key fobs), then you are still technically looking for aftermarket electronic car keys. Though these keys will not start the vehicle, they do unlock it, therefore serving as electronic keys. Aftermarket electronic car keys that have been purchased online can sometimes come to you already programmed. This is almost impossible for a normal person to detect, as the car it will open is nowhere near. All that will happen is the key will be impossible to program. It will be pure frustration up until the moment you give up trying to make it work. Then you will be understandably upset and still have to purchase and program a new key. And hopefully, you will not look to buy anymore aftermarket electronic car keys from low-quality sources. Once any aftermarket electronic car keys are programmed, they cannot be reprogrammed. You need to make sure that the product that you are buying has not been used on anyone’s car already. This is easier with transponder keys, as you can look at the key blade. Any aftermarket electronic car keys that have been cut are undoubtedly programmed. When you take car key replacement into your own hands and decide to do the research and purchasing of aftermarket electronic car keys yourself, there is a fair chance you will not get what you need. The first mistake you can make is not knowing what type of car key you need. Beyond needing to know if you need a remote, transponder, or fob, you also must be sure that the aftermarket electronic car keys you are buying work for your make and model of automobile. Be sure that you are using a distributor that details the functionality of all of their aftermarket electronic car keys. Issues with quality mostly come from off brand aftermarket electronic car keys. Generic devices that do not have the logos or exact look of your previous electronic key can use thin, brittle, or soft plastic. This makes the key significantly more delicate. As much as I would like to be able to tell you to simply be more careful with your keys, it is just not realistic. People throw their keys down on counter tops. They get dropped on an ‘accidental’ toss to a friend or just when there are too many things in your hands. Other than the physical reliance of the aftermarket electronic car keys, there is also the issue of the electronics. Poor connections or cheap components can significantly decrease the lifespan of aftermarket electronic car keys. Proximity requirements for effective use can become inconsistent or extremely strict. Buttons on the remote may stop working, decreasing the functionality of your device. The key could also simply stop working and leave you in an unanticipated car lockout. If you are experiencing any issues with your aftermarket electronic car keys, then you will need to reach out for some assistance. The problem with many distributors of aftermarket electronic car keys, is they do not have knowledgeable customer service. Some do not have customer service at all. This type of backup is extremely important for aftermarket electronic car keys because the devices need to be programmed. Programming is much simpler if you are just looking to duplicate car keys. This can be done at a locksmith shop and even most hardware stores. Programming without a spare key is a different story altogether. This type of setup can be very tricky to the uninitiated. And because almost every car has a different process, it is very unlikely that you will be familiar with the exact programming procedure. If you are planning to do this yourself, make sure that the retailer for your aftermarket electronic car keys has a customer service phone number. Without someone there to help you troubleshoot your programming issues, you will probably end up calling a professional. The best way to avoid the dangers of aftermarket electronic car keys is to turn to a reputable seller. To really get by all the issues, it pays to have the devices professionally programmed. This also gives you the opportunity to invalidate all existing keys, in cases where a car key was lost or stolen from you. Avoid the danger. Get what you need. And drive safe.